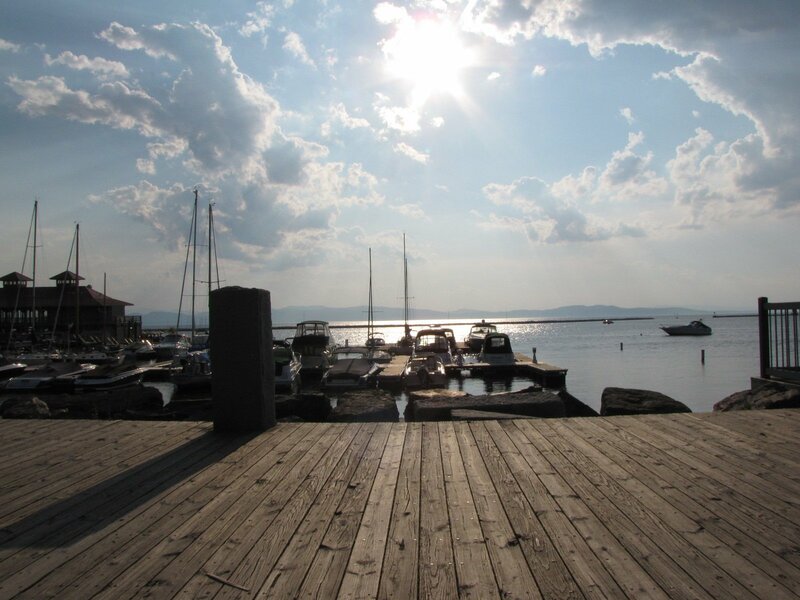 I was thrilled to be a part of the USA Triathlon Age Group National Championships in Burlington Vermont recently. The preparation for this race began many months prior first qualifying for the event and then making arrangements to attend: getting a hotel, rental vehicle, shipping my bike, booking flights etc. With each passing day I grew more excited and when the day came to head to the airport I just couldn’t believe the highly anticipated trip had finally arrived. With my bags packed my sister, Mom and I headed to the airport for a fun and eventful trip. It didn’t take long before the laughter began. We laughed about how we hoped we would find the car when we came back home and giggled about seeing ourselves wandering around the huge airport parking lot for hours in search of our car. As we entered the airport we couldn’t help but wonder if we might have to have our bags searched and hoped IF we were patted down it was by a good looking guy. All went well and we only had to hand over the oversized bottles of shampoo and hair care products. We marched onto the plane when our zone was called and found our oh-so-comfortable and roomy seats (can you detect my sarcasm?). The flight went well and we survived (no crash or hijacking). 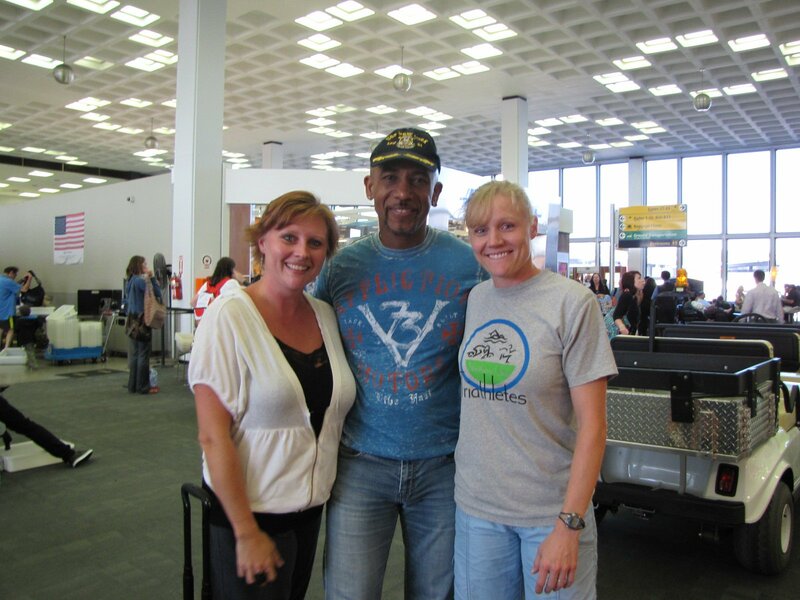 We enjoyed a long layover in New York City exploring the JFK airport and happened to run into Montel Williams. Soon we made our next connection and landed in Vermont in the middle of the night. The rental vehicle I had previously arranged for was waiting for us and on the way to the hotel we decided to hit a local supermarket that was still open to get the necessary previously confiscated hair care products (we certainly didn’t want to go with out – humidity does interesting things to fine blonde hair with some natural curl). I am sure we were memorable to the workers at the store – nothing like giddy tired girls walking through the store in the wee hours of the early morning trying to remember what they came for and laughing at everything and anything. I was beginning to worry that my abs were going to be sore for the race. After a fairly decent good night’s rest – well, sorta – the time was two hours later than Utah time which meant the sun came up two hours earlier – which is like 4 a.m to us. I rise with the sun naturally so I wasn’t as refreshed as usual when the sun came up over the horizon with only a few hours of rest. For this reason I was glad we had come up one day early so I could be better adjusted and rested for the race. 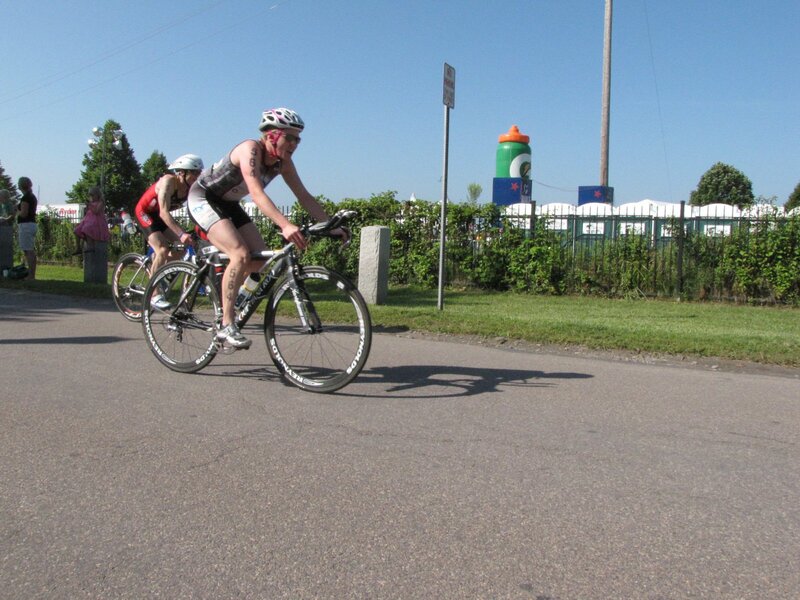 On the agenda for the day was to put together my bike, pick up my packet at the expo and review the race route. 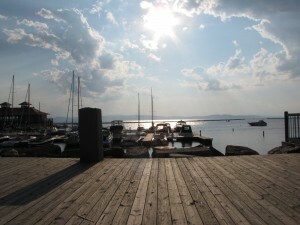 The venue was absolutely amazing and the swim was beautiful at Lake Champlain. 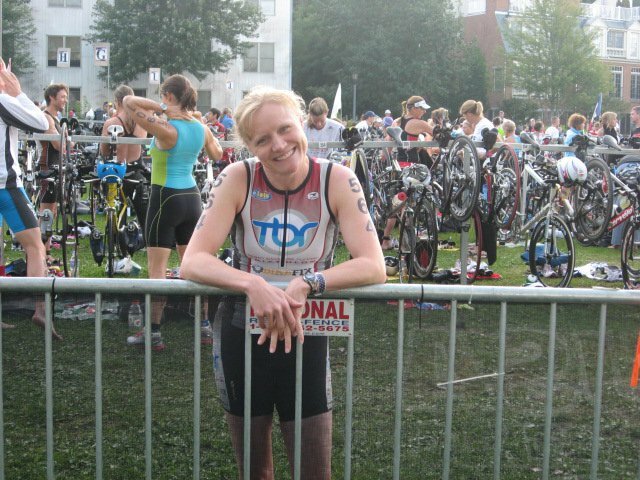 Upon reviewing the transition area I could see everything would be well marked (the benchmark of a high quality race); as we drove the cycling route I knew it would be challenging and I hoped my gears and bike would be up to the task. As you can imagine with thousands of athletes there were many other competitors out reviewing the route. This is when I realized these folks meant serious business. They had the latest and fastest bike with the super sleek “alien” helmets (as I like to call them). I could only hope that my bike and regular helmet would do (their bikes and wheels would easily cost between $6-10,000 each). Truly a lighter carbonfiber bike would be faster than a heavier aluminum frame which I had – but I was confident that my bike with carbonfiber wheels would do just fine and I was determined to pass many of those fancy bikes as I could and put my trust in the engine behind those pedals. By this time it was getting close to dinner time so we headed to local a restaurant that was highly recommended to us by a local that was sitting by us on the plane. Can I just say the people in Vermont are super nice and all were kind and courteous (even the drivers). The lush terrain was just beautiful and the humidity, well – the humidity was a different story. With a little better nights rest under our belts the next day was spent going to the race briefing to review the event rules (I think my sister and Mom learned more than they ever wanted to know about triathlons), and reviewing the running route. The route started with a super steep climb, which I thought was nice to adjust from the bike as long as you didn’t push to hard to build up a lot of lactic acid or have a really high heart rate. With all reviewed and after the cloud burst of rain (really it was quite sudden – you can image how awesome our hair looked after that as we were outside in the middle of it clinging to the base of a tree laughing about how silly we must have looked. We were real “tree huggers”. After the rain stopped I placed my bike in the transition at its assigned number spot and hoped it would be there in the morning when I came to race. (Actually I wasn’t too worried as I know they had great security. This was a very well organized event as you can imagine). Race morning started early as many people that know me know I like to arrive early to a race (I am not a last minute girl). 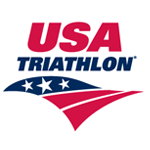 While setting up my transition I chatted with area athletes and soon realized they assigned all the people in my age group to this same area in transition making it so nobody had any advantage over others in the division. After putting on our wetsuits we headed over to the boat dock to begin our treading water start (I like tread starts as it allows me to warm up and get the jitters out). Soon we were off. The day before the race my Mom asked. “What do you think about during the race?” So as usually I thought about my form, and focused on technique, cheered myself on with positive words like, “You can do this” or “You are doing great – keep it up!” I also prayed that my goggles would not fog up. (I had a major problem with this in a race earlier this season and brought brand new goggles so I won’t have to deal with it this race). 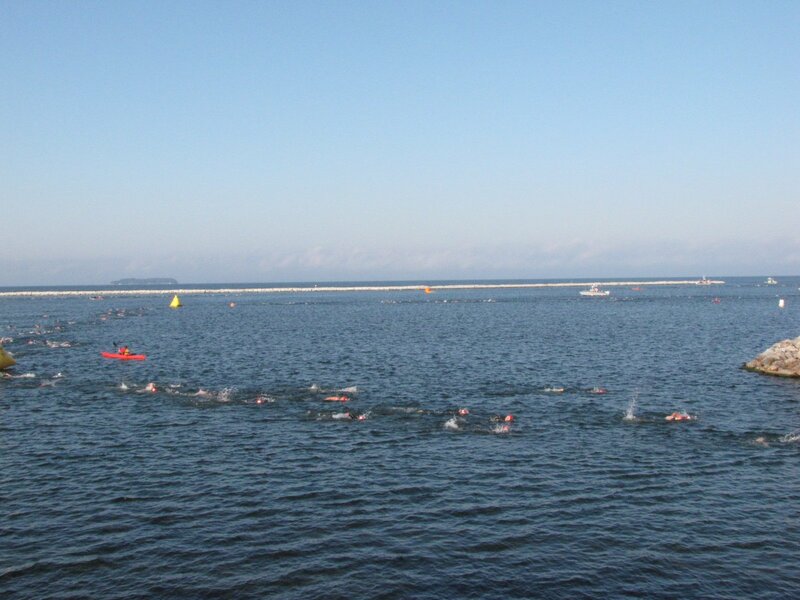 Although it took me a while to get into a good pace I was delight to be able to see and was pleased to think I swam fairly straight (a challenge with a previously damaged left shoulder). 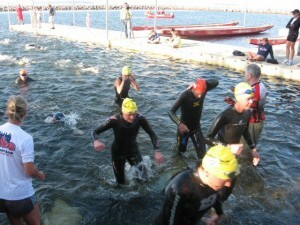 After glancing at my watch while heading to the transition I realized I had some time to make up from the swim. The transition went fairly smooth and I headed out on the bike. I was still a little nervous to get out of the business/residential area as there were many athletes on the course and it was tricky maneuvering around everyone. Finally we were out on the highway and more rural roads that allowed for more space and I was able to get more comfortable and into a more typical pace for me. The route was challenging with a series of rolling hills and turns along with a plethora of athletes all vying for a great spot without “drafting” or getting a penalty. After the turn around I was pleased to be able to really push the pace and was determined to continue to pass all the fancy bikes that I could and I did. As I headed out for the run – I felt pretty strong and passed quite a few people on the steep hill. At the top it took me a while to find a comfortable pace again. I know the run would be tough as I know my endurance wasn’t where I wanted it. (Unfortunately I was involved in a car accident three months before the race which broke my arm and I missed many weeks of training so it could heal). The first four miles seem to go by quickly but then I started to notice that the humidity didn’t seem to allow my body to cool so I felt super hot and with the combination of the blisters on the balls of my feet I slowed. I was still passing people but certainly a noticeable slow down. Either way I pushed through and was thrilled to cross that finish line having completed a fiercely competitive race. If you are interested in watching my race in action, click here (I’m the red dot). 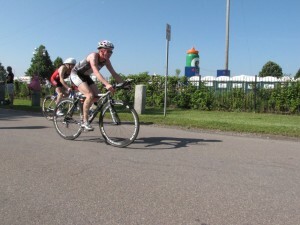 Normally I am used to placing in the top 1% of races in my area and quite honestly my efforts would have for sure yielded a top-three place in any Olympic distance event in my area. My place in this race was in the later half of the division and in the middle of the 672 women that competed (there were 994 men out on the course as well. There were several hundred more athletes who competed in the Sprint Distance event). I remember hearing over the intercom that many people had qualified for the Olympics and this was also a World Championships qualifying race so this is a testament to the competition that was there. 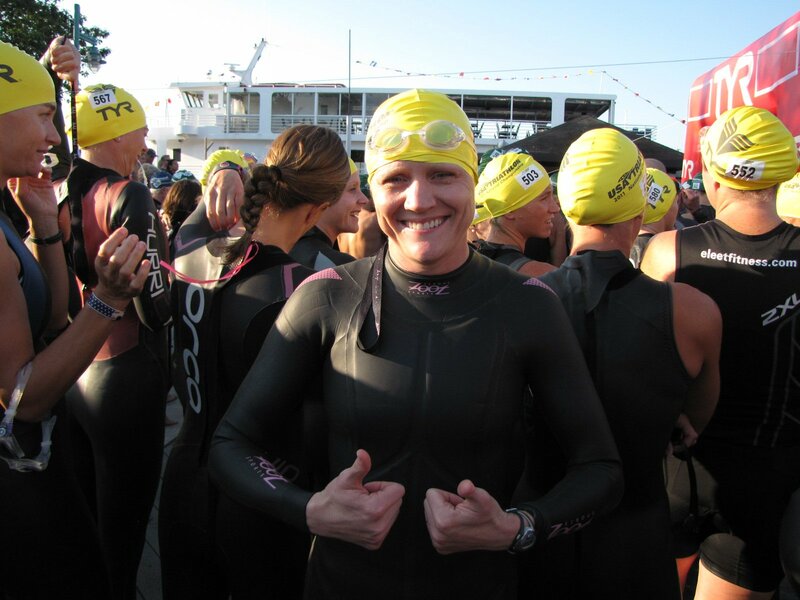 I was pleased with how I did considering everything and was thrilled to have an opportunity to experience a race that many people may never experience. I left with the desire to improve and do it again – only better. (Oh, and by the way we did end up finding our car and didn’t even get lost in the parking lot – not too bad for three natural blondes). Thank you so much to those that donated to make this race possible for me and especially my Mom and sister for coming to support me. 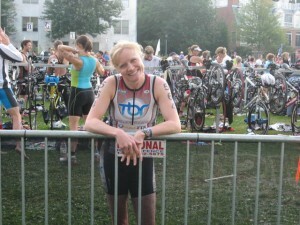 Your kind words of encouragement and those that followed the race are very much appreciated. Special thanks to: Bobby Lawrence Karate in Centerville, Bike Fix, Willow & Wildflower, and Elete Electrolyte. 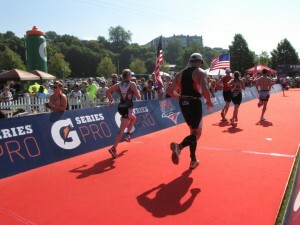 Triathlon training, racing and travel are expensive and sponsors are very hard to come by. If you are able and would like to help me with training and travel expenses to help me get to Nationals in 2012 (and another shot at making the USA team for the World Championships) please donate. Even small donations are appreciated. Donations can be sent anytime through paypal to theblonderunner@gmail.com. Company sponsors are invited to message Lora at lora@blonderunner.com. Thank you for your continued support. Blonde Runner fans and supporters are very appreciated.